Candy is Like the Cartoons of our Past and Present! My favorite candy choices seem to be just like my favorite cartoons. They always bring a smile to my face or a burst of laughter to even my most trying days! As a kid, I’d love to sit and watch Top Cat, Underdog, Scooby Doo, Popeye and even Atom Ant, all while eating some of my favorite candy. I guess that’s why when we decided to take our candy selections online to sell in 2000, I had the website built in cartoon mode. Yes, that was almost 10 years ago Blair Candy not only went online, but turned cartoon too! Not only has our website changed the past 10 years, but the candy and cartoons have too! One thing that hasn’t changed is the smile and laughter our sweet treats bring! 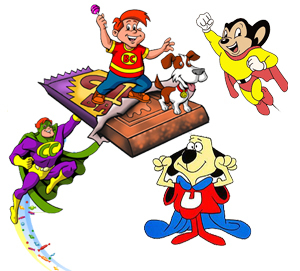 Even though we can’t take any credit for the goodtimes Underdog , Porky Pig or even Tom and Jerry put on our faces, we can for the sweet treats some of you enjoyed while watching them. There was nothing better than watching Popeye squeeze that gross looking spinich out of that can all while I was allowed to eat a bag of Sugar Babies or watch Mighty Mouse save the day as I tried and tried to get to the chocolate center of my Tootsie Pop lol. Our new candy website you see today was thought out, built and designed just like the Cartoonists, Ilustrators, Programmers and Producers use to build a cartoon. That’s why we feel this is the sweetest one yet! The Cartoonist and Illustrators at EY Studio’s brought our candy chocies to life and even added a special super hero of our own, that’s going to bring you sweet special deals everyday. We hope you all have as much fun shopping and eating, as we all did making it!